This is the Parent category for all posts that would fall under the heading of Social on the main menu. The minutes from the December 14th meeting: motion to approve was made by Mark, Tony 2nd, and approved by all. Guests: Approximately 90 guests were in attendance. Social Committee Report: Mollie Mann: next event will be a Valentine Ice Cream and Cake social. February 11th from 2:00 pm to 3:30 pm. Cost is $3.00 per resident or guest. Details will be in the Voice. GSMOL Report: Ellen reported 2018 HOA dues are $15 and dues for GSMOL are $25. Anne Anderson is running for vice-president of GSMOL. Next GSMOL meeting is January 26th at 6:00 pm. The attachment below are responses to questions from Ellen from Rosa Paredes. Financial documents are available for review if you would like a copy. When turning in your HOA dues please fill out the form and include your email address. The forms are on the front counter and have all Board members info on the back. Pool is now open and is reheating. Burglaries of unlocked cars. Since Dec 2nd and into January 12-15 cars have had items stolen from their cars. If this has happened to you please file a report with the Sheriffs’ Office and let the office here know. Also let the HOA know as it apparently is not on the “to do” list of San Vicente’s office to alert the residents that burglaries are being committed. Is it possible the gates could be reprogrammed? A gate remote control was stolen from one of the vehicles. Possibly the Security Guard who works for St. Vincent’s could make a trip over twice a night for security. Rosa is in charge of that. Maintenance shortage: our crew of 4 is not enough for the size of our park. 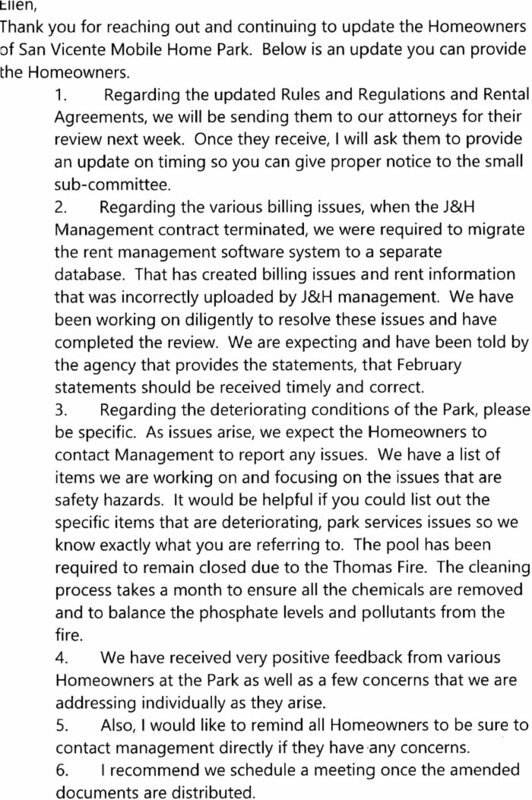 Many complaints of Park’s condition is suffering badly (see last 2 month’s minutes) Office staff: Unprofessional, unfriendliness and lack of common sense of Manager. Sometimes door is locked even though employee is inside the office, too many times there is no one IN the office, reports of residents being treated more as annoyance and unbelievably that 200 ash masks that were hand delivered by a resident to the office to be freely given to residents during the height of the Thomas Fire were refused by office because of liability issues?? Who does or says that with a Park full of elderly and older residents? The Voice does not need to be approved by office as it is a publication from the residents for the residents. Also, residents would welcome management to put articles of what is going on to be printed in the Voice but to date hasn’t done so. Residents are asking if a new phone book will be printed for their use. Also since the office is not handing out (see last month’s minutes) the new resident packet for new people moving into the park will need a box out front for that. Emergency phone number is not working, (see last month’s minutes) little to no response when dialed by residents, discovered to be basically an answering service who select which messages are passed on. New personnel in the office for a staff of two is welcomed, however, could lunch hour be split so there is always one person in the office and not both go to lunch at the same time? Disaster Preparedness Group, (DPG) has no administrator and are short Block Captains. Office is lax in explaining to new residents what the green “OK” is on your mail box flap and not to turn off gas to your unit in an emergency etc. etc. New residents still waiting for their names on mailboxes (see last month’s minutes) some waiting three to four months have begun to put their own homemade signs up contributing to the list of what is not getting attended to. On a more upbeat great note the Social Committee and HOA now have the insurance policy for wine and beer to be served at their events. St. Vincent’s has graciously offered to compensate the Social Committee for it. That received a round of applause from the large group attending the meeting.